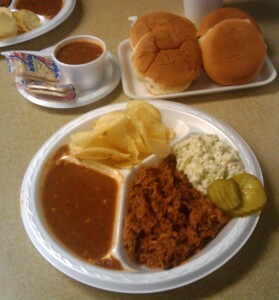 Yesterday my in-laws arrived with a pound of pulled pork and a pound of Brunswick stew from Fincher’s Bar-B-Q in Macon, GA. This is by far my favorite barbecue, and is really my first barbecue. I took this picture at Fincher’s in December. Look at that sign. When you see a sign like this there are two options. Either the restaurant is long abandoned, or it is home to some great food. Luckily this place is home to some great barbecue. Here is a link to the Google Street View. Fincher’s is a vinegar-based barbecue, though not as strongly vinegar-based as one I recently sampled (but that will be another post). It is definitely not the tomato-based sauce many folks expect, and it is delicious. A little back story. I am a Cincinnati native, so I was quite surprised the first time my wife wanted to go to a BBQ joint. I am sure this is not true of everyone who grew up here, but when folks served BBQ to me growing up, it was basically sloppy joes in a moderately spicy sauce. So I was reticent to go. My first experience at Fincher’s in Macon was a revelation. I suddenly got it. You can see above the plate an extra Brunswick stew and hamburger buns. It is heaven on a divided styrofoam plate. Honestly, this post is a reach for this blog. I doubt you are going to rush out to drive to Fincher’s. After all, it is an 8.5 hour drive from downtown, but if you do find yourself driving through Georgia on I-75, hungry for some barbecue, you should give this place a shot. Just be sure to bring back some pulled pork and Brunswick stew as a thank you. I moved to Ohio from Georgia about a year ago, and I grew up about an hour south of Macon (and even lived in Macon for a couple of years after college). Fincher’s has always been my absolute favorite BBQ, so I’m pretty excited for you… and a little jealous! So just goes to show, this post wasn’t a reach at all. It made my day. Fincher’s BBQ is the best anywhere! I was born and raised in Warner Robins, GA and after graduating from high school, I lived and/or visited all over our great country, including Alaska and Hawaii! I must say I have not had any BBQ Sauce or Brunswick Stew that could compare to Fincher’s! I have found BBQ in Austell, GA (Wallace BBQ) and Phenix City, AL (Mike & Ed’s BBQ) that I like as my local favorite, but nothing cures that Fincher’s craving and I have been known to drive 2 hours from ATL to get that delicious BBQ, Stew, and one-of-a-kind hamburger taste. Even my Aunt and Cousin drive 2 hours to Macon from Columbus! Nothing compares to Finchers, nothing! I love everything about it! I started with my first sandwich in 1964, nothing else, anywhere else has ever come close. I do prefer the location on Houston Road, because its large and neater looking. And, if you never, try the pork chop! Just try it! Dang! I love Finchers BBQ. 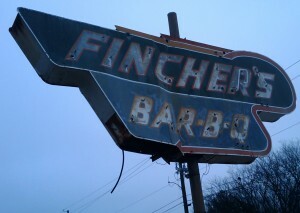 I live in the Seattle area now and when I lived in Macon, Finchers would be a weekly stop for me. 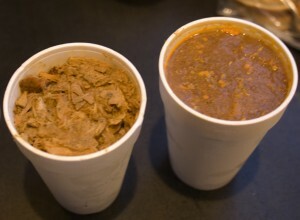 The best bar-b-que and brunswick stew in the US…..by far. I now live in KY, but when I go to Ga., I make a special trip to Macon to get some of the good stuff to take back home. It freezes well and is wonderful to have in the fall for football season! I grew up in Macon, my dad would bring Finchers to me every night when he came home from work. I moved to S.F. and my mom would bring it to me frozen wrapped in tinfoil, a whole suitcase full. Now they sell the sauce by itself…a long time coming but quick to go. You owe it to yourself to try one of hte cheeseburgers too. By far the best cheeseburger Ive ever had from a restaurant, but I love well-seasoned hamburger meat. They also have my favorite brunswick stew ever. 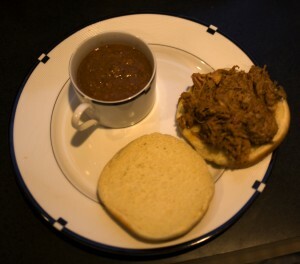 The barbecue is very good, but to me the burgers and stew keep me coming back. I’ve been eating Fincher’s most of my life (50 yrs). Their brunswick stew is the best there is and the only thing I craved during 2 pregnancies! I live 20+ miles from Macon but have to have my “fix” of Finchers at least twice a month! Ha My husband is from Macon and this is by far the best Brunswick stew! He grew up on this BBQ and I, being from FL love it too! So wish I had the recipe! Great Post! Let me know if you find a way to make it!